Just had my first post-match Monday morning email. A welcome surprise - well done to all who produced it. Hopefully everyone on one of our other mailing lists has got the first one. After that you need to tell us if you want to keep getting it. There is a link in this story below to make sure you are signed up. Credit for this goes to Peter Jasper & Kev Luff. Think they have done a great job. 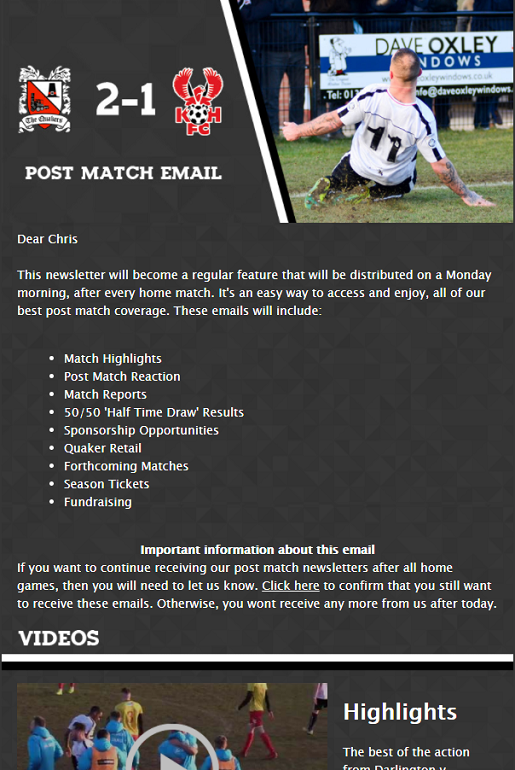 If you want to receive the post match e mail, sent out on Monday mornings at 8am after a home game, then please enter your email details by clicking on this link. Got mine and subscribed to continue receiving them. Great idea - looks very professional and very informative. Have signed up for more!